Scrub the potatoes of any excess dirt and prick them each several times with a fork. Place them on a baking sheet, drizzle them with EVOO and season with salt and freshly ground black pepper, tossing lightly to coat. Bake the potatoes in the oven until tender, about 45-60 minutes, depending on the size of the potatoes. Remove the baked potatoes from the oven and let cool enough to handle. When the potatoes have about 10 minutes left in the oven, place the tomatoes onto a baking sheet and drizzle them lightly with EVOO. Season them with salt and freshly ground black pepper and roast them in the oven until they’ve blistered, about 15 minutes. While the potatoes are cooling, combine the buttermilk, garlic, hot sauce and herbs in a small mixing bowl. Season the ranch mixture with salt and freshly ground black pepper and reserve in the refrigerator until the potatoes are ready. Once the potatoes are cool, cut them in half lengthwise and scoop the insides out into a mixing bowl, leaving a thin layer of flesh still intact on each half. Be sure not to pierce the skin of the potato while doing so. Add the ranch to the potato and mash lightly to mix everything together. Season with salt and freshly ground black pepper and scoop the filling back into the hollowed out potato shells, dividing it evenly between all eight potatoes. Place the potato skins back onto a baking sheet and sprinkle the cheese over each of them. Place them back into the oven to melt the cheese, 1-2 minutes. Top each potato with some of the roasted tomatoes and serve them up with your favorite side salad alongside. In Recipes-list.com we have selected the most viewed recipes from category - uncategorized . Enjoy the best recipes specially selected for you! 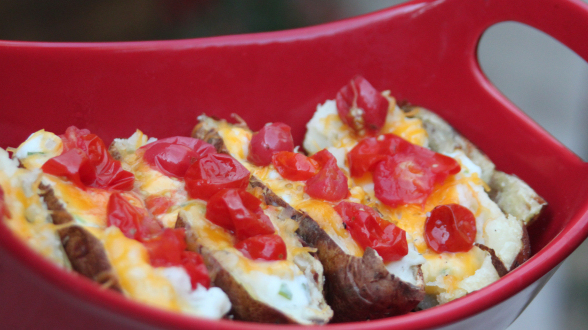 Ranch-Style Potato Skins is the right choice that will satisfy all your claims.